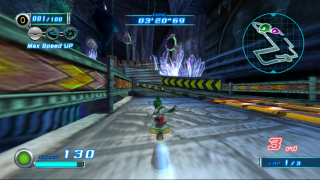 Gigan Device is the first level in the Babylon story of Sonic Riders: Zero Gravity. An ancient Babylonian ruin hidden deep in the mountains of the Gigan Rocks, the stage is a moonlit temple complex, with Chinese-style pagoda temples on the outside and eerie blue-fire braziers within. Unusually long for an opening Riders course, the level is particularly kind to Speed type characters, with two seperate grindrail sections to get ahead of the competition. Gigan Device is the game's first level chronologicly, and opens with the Babylon Rogues attempting, once again, to loot their own sacred heritage. While Wave and Storm watch anxiously, Jet taps away at a ruined Babylonian keyboard, attempting to disarm boulder traps like some kind of avian Indiana Jones. Successful, he swipes the ancient treasure from the temple's 'sacred chalice': an Ark of the Cosmos, engine wreckage from the ancient Babylon Garden. Auspiciously, Jet's new acquisition is accompanied by a trio of shooting stars - unbeknownst to the Rogues, other Arks of the Cosmos pulled down from orbit by the two units now active on the surface of Sonic's world. Indeed, one of the shooting stars lands rather too close for comfort; an impact explosion over the horizon dislodges the trap Jet had just disarmed! The boulders tumble down to crush the three birds - but then Jet's Ark springs to life, activating its gravity drive and levitating the boulders in mid-air. Jet realises that he may just have been granted the power to outrace Sonic the Hedgehog, and the Rogues fly off to exit the ruins. The level's objective in story mode is simply to exit the ruins within 3'42''; Jet isn't even required to beat his compatriots to the finish. This page was last edited on 8 April 2018, at 08:57.